The Sheepdogs, made up of Ewan Currie, Leot Hanso,n Ryan Gullen, and Sam Corbett, are from Saskatoon, Saskatchewan, Canada. They are a Rock band that got started in 2005. They aren’t just any Rock band, however. Think back, for a minute, and recall all those amazing late 60s and 70s bands that we now call Classic Rock. Think about how amazing that music is. The Sheepdogs belong in that genre. A band that is truly lost in time, The Sheepdogs sound nothing, and I mean nothing, like today’s modern Rock. At times the Sheepdogs sound like The Doors, and not just a little bit here and there, a lotta bit, and quite often. It’s amazing, it’s pure, it’s fantastic Rock. 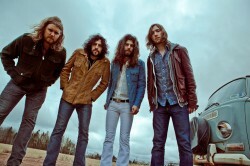 The Sheepdogs make some music that has kind of a bluesy sound to it, but louder and heavier. The Sheepdogs also incorporate the organ into their music, adding yet another dimension to this extremely talented band. The guitar work is brilliant. It is real and soulful. The Sheepdogs’ music often contains some rather tedious and extraordinary guitar solos that absolutely make you feel like you just stepped back into the Golden Age of Music – the 60s and 70s. The vocals are a perfect match with the songs and enhances that Classic Rock sound. And one of the great things about this band is that not only do they sound old-school, they look old school, too. They look like they are living in the 70s. MarsBands.com urges you oh-so-strongly to check out this band. We promise that you absolutely will not be let down.